I’m getting ready to get a no 7 plane to flatten my workbench and help with a few larger projects I have planned. I’m struggling to decide which to get. At the top of my budget is the woodriver plane at about $300 after 10% off coupon, but I’m tempted by the rockler bench dog plane that’s on sale for $239. But the bench dog looks very similar to the taytools and the grizzly ones on amazon for $149 and $88 respectively. Does anyone have personal experience with any of these planes? I’m also open to buying a Stanley no 7 from eBay but I’m worried about getting one that doesn’t have a flat sole. Is that reasonable? What would you recommend? I recommend the no 6 foreplane by LN. 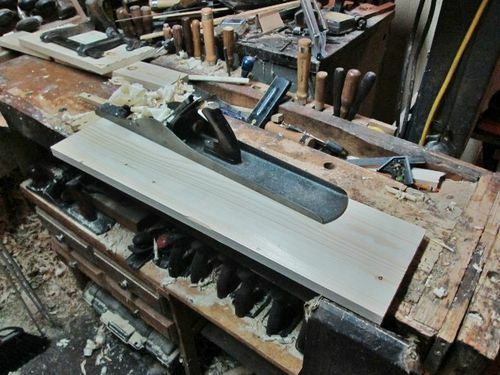 The jointer plane is too long its probably great for edges on 10ft long boards. Your gonna drive yourself crazy trying to flatten a table top with a jointer plane. I had same dilemma a few months ago. I knew i wouldn’t use it much at all after my bench build. Thought about an old 6 or 7. I would only buy veritas or LN if new, but couldn’t justify cost. Almost bought a 7 at an antique shop, but it needed a full restore. Then I saw a #29 transitional in perfect condition for $30. It just needed the blade honed. That plane works so good as a jointer and fore plane. The wood glides so nice its less tiring to use than my metal planes. Folowed that up with a 5 and then a 4 and my bench is super flat now. If have already fallen in love with using hand planes, and can afford to buy new tool: Buy Veritas with PM-11 blade. The blade sharpness longevity, and ease of sharpening are worth every cent over price of WR plane with A2 blade. Buying cheaper plane and adding the PM-11 blade makes the WR, or LN planes too expensive. I don’t use my LN plane as much lately, as I dread extra time spent fixing an A2 edge if lumber is not perfect and knot damages the edge. Dislike sharpening A2 so much, replaced them all with PM-11, and/or sold them. Comments about #6 .vs. #7, all sum up to personal preference. I use my 7 to joint any board over 3’ long. Less than 3’, I use the 6, or even lowly #5 for < 2 ft. If have not developed a love for hand planes, then spending hundreds on new plane will be disappointing if it doesn’t work as you planned. For someone new to #7 or planes in general; pick up an old Stanley, or Miller Falls from fleabay for ~$100, sharpen the blade and learn to use it. You will quickly figure out if you want to keep it and upgrade to a PM-11 blade, and/or sell it and break even when done. You almost always loose 20-30% selling a brand new plane regardless of whether is it’s top end LN, Chinese made WR, or India made Benchdog/Taytools/Grizzly. Another thing to note is unless you buy a high end Veritas or LN, every new plane is going to need some tuning after you buy it. All of the Asia made hand planes rush cast iron seasoning, and even brand new plane might require a little work to flatten the sole. Remember to not take forums to seriously, the above opinion and $5 will get a cup of coffee at Starbucks. careful…buying planes can be addicting..
+1 for a Lie Nielsen #6 or #7 but with a 50 degree frog. My #5 LN with a 50 degree frog worked wonders on a top with zero tear out. Now I wonder if my foreplane has the 50 degree frog. It might because it handles my hardmaple work bench top very nice. Ya know what Waho6o9 the high angle frog is very similar to how a bryd insert head cuts in a jointer machine. Compressing the wood fibers in a chip. Of the four planes I used on my work top the 50 degree frog worked best. Nice pic demonstrating the cutting angle to the fibers. 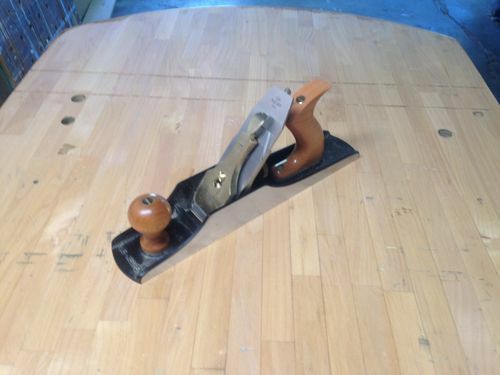 I have a vintage metal jointer which I like now, but I would go new or get a wooden plane if I were doing it again. Flattening a sole on a metal plane that long is not easy, and I assume that most vintage metal jointers will need flattening. If you go new, I would avoid a high-angle frog in a jointer. It’s not a finish plane. You just need any tear out to not be bad, and that can be accomplished with a standard frog. 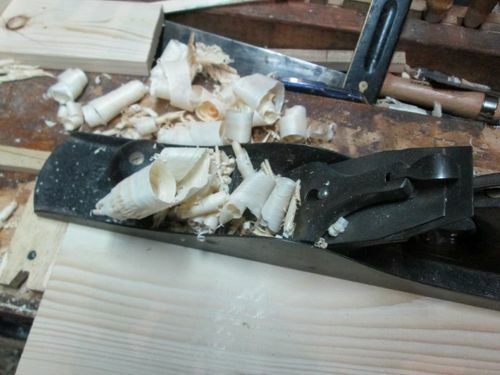 For a #7 I would recommend a Stanley or other used plane to refurb, or maybe the Taytools you mentioned, since like most $ is a factor, and tuning is not hard once you know how (read here). A transition or wooden jointer would be good if you come across one in good shape for flattening, but I prfer a metal plane for edge jointing. The oem blade and chip breakers work fine once properly tuned. Agree you do not want a high angle frog on a jointer – 45 deg and close down the chip breaker to reduce tearout if needed. Might as well get a 4-1/2 smoother (same blade/breaker/frog depending on type) to final smooth the bench. In that picture of my plane til….there are 2 No. 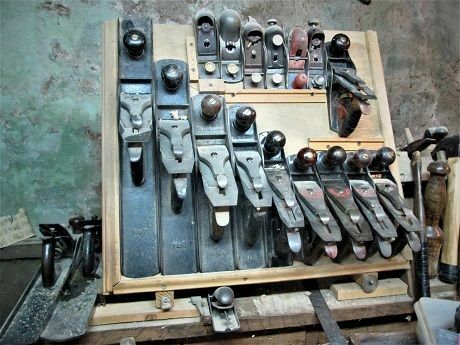 7s….in the til is a Stanley No.7c….type 9. The other is sitting beside the Stanley #8, type 7, and is an Ohio Tool Co. No. 0-7….The #6c in the til is a Type 10, The #5-1/2 beside it is a type 17…..all get about the same usage in my shop…all still use their original irons…except for the 0-7…it was broken, and replaced…..with another OEM iron…. I would go with an old Stanley. 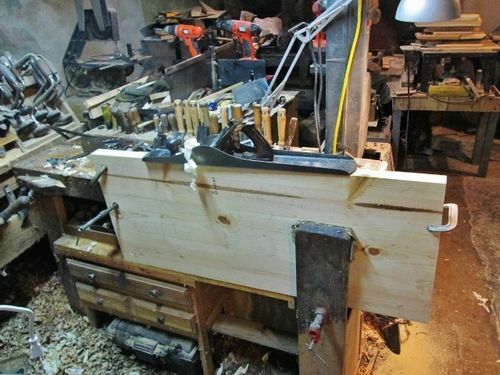 It will take you less time to recondition one than you will spend planing the bench. Re-grinding the bevel on the iron is usually the most time-consuming step. Don’t be obsessive about flattening the soles. On a bench, it should be good as long as the plane is not twisted. Of Stanley Bailey I have 5 No 7’s, 5 No 6’s and 2 No 8’s in a file cabinet in my shop. All but 1 or 2 are in pretty good ready to go condition. There is one number 7 which for some reason doesn’t plane as well as the others and another which I never sharpened. PM me if you are interested and maybe we can work something out. It pains me to type this. Really. I don’t want to sell any. But <sigh> even with my 6 children, I can’t really imagine needing so many. Thanks for the input all. It’s good to get some insight. For some more background I’ve been getting into hand tool working for about a year and so far I’m pretty sure I’m sold on using hand planes long term. I have a craftsman no 4 made by miller’s falls that works great, a stanley no 5 that works ok not great, and a veritas low angle jack. So I’m interested in filling out my bench plane’s for use but not too concerned about brand or whether it’s new or old. The thing that makes me nervous about an older stanley is flattening the sole. It seems like flattening a number 7 would be way harder than a 4 or 5. For those of you that have flattened a jointer plane, what abrasive do you use that’s longer than the plane itself? Do you use a roll of adhesive sand paper, or a grinding belt, or just regular sheets of wet dry and not worry about the seams? As for the 6 or 7 debate. I feel like an 18” no 6 wouldn’t be that much longer than my 15” laj. That said the longest board I anticipate needing to joint/flatten in the foreseeable future is less than 4 feet. Fingertips at the center at each end….does the plane rock when you press down with either finger? Fingertips at the corners of each end….diagonally from each other…..again, does it rock any? IF no to both of these questions, sharpen the iron, tune the plane up, put it to work. Those wood bodied jointers will “warp” long before the cast iron ones will….what some see as “warp” is merely wear, from almost 100 years of use. IF you still feel the need to “flatten the sole” ( Stanley machined these flat) would be to buy an 80 sanding belt, cut the seam out of the belt. glue the belt to some flat surface ( like MDF) and retract the iron, and “plane” the belt. Black sharpie, make a lot of lines across the sole….sand until they are gone…wax the sole, and put the plane to use. Save them feeler gauges for when you are changing the sparkplugs in the car. 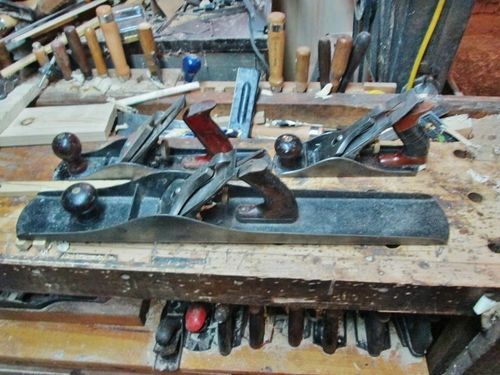 #4 , a #14 jack plane, sitting behind the #8…. +1 Don’t over think about flat sole. As long as mouth area is flat, and there is no obvious wobbles. Jointer plane will work as intended on large surfaces.